Alison Shaffer: Enter to win a Yearbook From Shutterfly! Enter to win a Yearbook From Shutterfly! The new school year is in full swing. Back to school nights are on the calendars, and students are busy learning and sharing in the classroom. From the first day of school parents are taking photographs of their child's field trips, holiday parties, school plays, sporting events, and graduation ceremonies. Instead of storing all those adorable photos on your computer, share them in a yearbook you can create from Shutterfly! These yearbooks are so adorable! Choose from a variety of templates, designed pages, and more. Shutterfly offers tips on making your yearbook, and even a disccount when you contact them. You can get the whole class a yearbook for as low as $6.00 each. What a great price. I've paid around $40-$80 for yearbooks for my kids and they did not look nearly as nice as Shutterfly's. I really like that you can use your own photographs and chose the layout. You'll know what your are getting since you design the yearbook. Hold a day of sharing when families can bring in their photos to put in the yearbook. Everyone captures different moments of the year so share your photos for the yearbook. Head over to Shutterfly's yearbook site and see how easy it is to make your own yearbook. The templates, designed pages and colors are awesome! 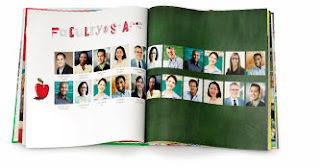 This type of yearbook is perfect for pre-school all the way through high school. closed,Giveaway: Shutterfly is giving one lucky reader a 8x8 hard cover 20 page photo book, plus shipping (including Canada). This is a $38 value. Disclosure: I received a Shutterfly Yearbook to review. The comments and views are my own. My son is in his last year of preschool. I've been photographing his art work over the past two years that he has made at school, since I don't have room to store every project. I'd like to make a photo album of all the pictures of his work, with how he looked at this age, to save for him when he is older. Thanks! I would add all the funny things my kids say! This would be great to capture different big school events during the year - like the Halloween Parade and field day. following them on twitter and pinterest- this is great. mine would be allabout my kids! I would definitely be putting pictures of our son, dog, new rescue puppy and costa rica trip in there. it would be an awesome prize!! I love Shutterfly so much!!! Thanks for telling us! I would use the book to document my daughter's Kindergarten year. I did this last year for my 3rd son, and had a lot of fun putting the book together. I have to go back and make one for my second son, too. I would include pictures from Halloween and school events. Love love love Shutterfly.